Mini Cooper Outperforms Competition in Recent Crash Test | Atlantic Autowerks Ltd.
For Virginia Beach and Portsmouth families looking to purchase a new car, safety is almost certainly somewhere on the list of must-haves. Whether you're looking for a compact, medium-sized, or large vehicle, you'll be happy to learn there are safe and stylish options in each category. Most recently, the sleek Mini Cooper Countryman joined the elite group of safe compact cars by passing a crash test with flying colors. When you're looking for a car, safety is one of those things that isn't always number one on your list, but is usually included somewhere. Most shoppers start with style, fuel efficiency, or comfort features, but to skimp on safety is a major risk. A past complaint regarding compact cars has been the lack of safety and stability in collisions. While some compact cars have proven an inability to reliably stand up against force, the Mini Cooper Countryman has proven it can be both stylish and safe. 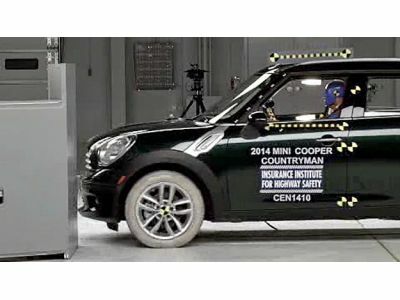 In the most recent Insurance Institute for Highway Safety crash test, the Mini Cooper Countryman received the only 'good' rating out of the 12 compact cars participating. Specifically, the test was a small overlap front crash test - the type that simulates a collision on the front corner of the car. This type of crash accounts for almost 25 percent of all fatal or serious injury crashes and is a major concern for owners of compact vehicles. In the test, 25 percent of the driver's side front end struck a 5-foot high barrier at 40 mph. The test dummies on board calculated force, damage, and other factors. According to Joe Nolan, senior vice president for vehicle research at the institute, "The Countryman's safety cage held up reasonably well. The safety belts and air bags worked together to control the test dummy's movement, and injury measures indicate a low risk of any significant injuries in a real-world crash this severe." While the Mini Cooper Countryman performed the best, alternatives like the Fiat 500L, Nissan Juke, Mazda5, and Nissan Leaf all earned 'poor' ratings by failing the test. While these models didn't impress, Nolan was satisfied with the Countryman, saying it "gave a solid performance." If you are looking for Mini or BMW repairs, maintenance, or parts purchases in Virginia Beach or Portsmouth, let Atlantic Autowerks show you why we've been in business for more than 30 years. Contact us today!